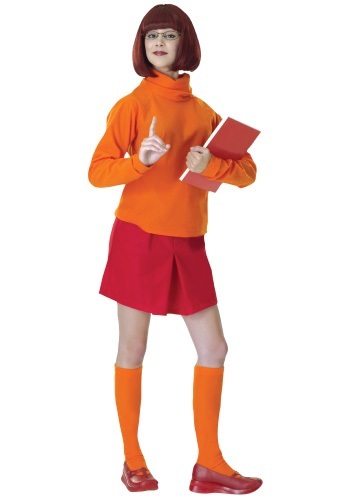 A gang always needs someone who is the brains of their outfit and Velma Dinkley is one for Mystery Inc. When these meddling kids are out exploring the various haunted and creepy mansions trying to solve crimes that cops are too busy to take care of this nerdy girl is first to look for clues. After searching around for anything when Velma finds something she screams out "Jinkies" but she has to keep her excitement contained. If this girl becomes too excited or too scared she just may lose her glasses which have been known to fall off every so often. With the frequency of how many times they fall off you'd think she'd carry an extra pair. Now you can become the smart girl in a skirt of your group with this great look!